The next time you hop on that modern bike, thumb the starter and point off to the horizon without a worry about your trusty (insert favorite brand of motorcycle here), think about trying this in 1915. And suppose you had decided that instead of a leisurely ride, you had entered a race with your trusty Flying Merkel or Excelsior. And it was a race across the country. After that has sunk in for a while, remember, these pre-1916 motorcycles were generally rigid framed, single speed, leather belt driven, rear only clamp type or coaster brake with a blazing carbide lamp in front to light the way. 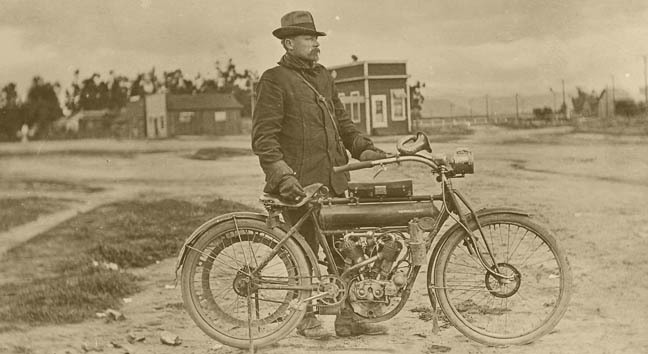 And even before that, back in 1903, George Wyman became the first person to traverse our great continent on a motorized vehicle, making the run from coast to coast on a 1903 California Motor Company motorcycle and documented the journey extensively. 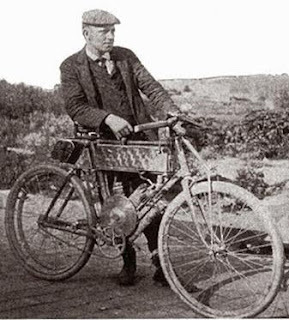 Riding from San Francisco to New York, Wyman encountered many obstacles and mechanical problems during the run, but his determination and the endurance of both himself and his motorcycle, showed the world that such a thing is possible. He did it in just fifty days. The interstate system wouldn’t be started for another 53 years. Paved roads were rare if any and just getting any distance at all on the roads of the time took a lot of time and planning. The 2010 Cannonball Run is a Coast-to-Coast race on Pre-1916 Motorcycles. There are three classes of bikes that you can enter. Class 1 is Single Cylinder, Single Speed. Class 2 is Twin Cylinder, Single speed. Class 3 is Multi Cylinder, Multi Speed. Only motorcycles built before 1916 can run for the prize. This year's Cannonball is dedicated to Bud Ekins. Aside from an accomplished racer and stuntman, Bud loved pre-1916 motorcycles and rode them every chance he got. If you haven't ever got the chance to see these bikes up close, do yourself a favor and get out to see and hear them in person.